Anna Celeste Burke presents Book 4 of the Jessica Huntington Desert Cities Mystery series. 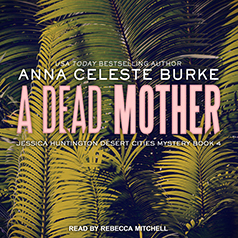 Jessica Huntington is back in the fourth Desert Cities Mystery by USA Today bestselling author Anna Celeste Burke. Jessica's ex-husband, James Harper, and her mother, Alexis, are in big trouble in A Dead Mother. Family dysfunction, infidelity, murder, and mayhem—what else can you expect from members of the rich and famous who move in Jessica Huntington's circles? An arraignment in court goes off the rails after Jim Harper's Bel Air mansion is trashed and a man is left fighting for his life. Jessica's love life almost veers off track, too, as she struggles to balance job, family, sleuthing, and her attraction to Attorney Paul Worthington and Detective Frank Fontana. When a prominent member of the Palm Desert community is found dead on the side of the road, Jessica gives up hope that this year will be better than the last. It's a three-ring-circus of calamities as Jessica and her friends get pulled into another whirlwind whodunit.